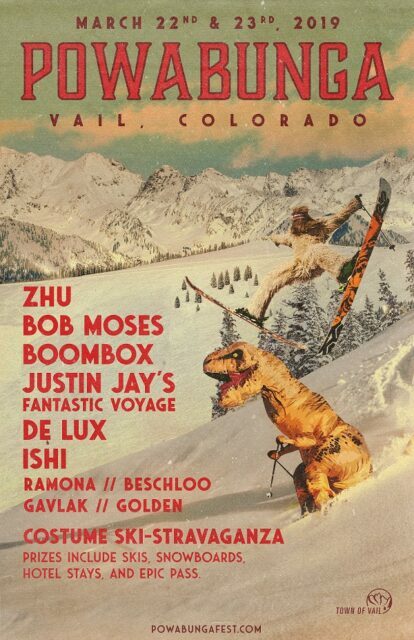 Vail, CO – Today, Powabunga – the inaugural music, mountain, and art festival in Vail, Colorado on March 22-23, 2019 – announces its lineup, featuring performances from viral powerhouse ZHU, Grammy-winning duo Bob Moses, Boombox, Justin Jay’s Fantastic Voyage, De Lux, ISHI and more. An immersive experience spanning the festival stage, the slopes of world-class Vail Mountain, and parts in between, Powabunga highlights Colorado’s uniquely vibrant mountain culture and the stunning beauty of the Vail Valley. With two nights of music at Ford Park, large scale pop-up art installations, exclusive apres ski and post show after-parties, and an over-the-top Costume Ski-Stravaganza, Powabunga promises a fun-filled weekend celebrating the joyful spirit and diverse offerings of the Rocky Mountains. Tickets for Powabunga are available now at powabungafest.com, with a limited number of discounted $99 Early Bird 2-Day GA Passes and $299 Early Bird VIP Weekend Passes—offering access to preferred viewing areas and VIP tent hosting exclusive bar and food, upgraded bathrooms, and sponsor schwag, after-party pre-sale options, and more—available while supplies last.